Steve Daniel has been an active GLSPS member for nineteen years, almost the entire existence of the Society. He’s served on Board of Directors since 1999, including 5 years as President. He finally had to step down from the Board recently, after retiring and moving to Duluth. He’s been consistently active as Chairman of the Put-It- Back (PIB) Committee. Their most recent project was returning the Mataafa rudder to Lake Superior, just off of Canal Park. 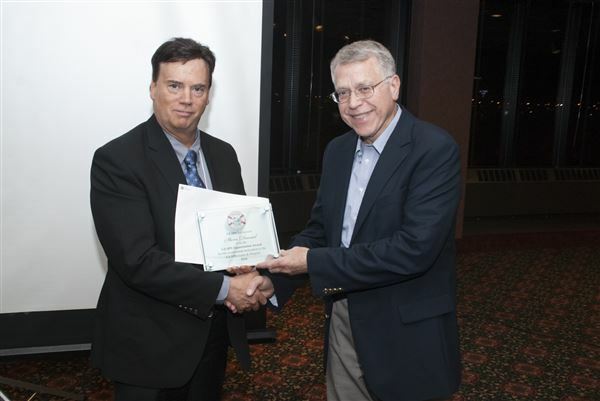 He initiated and led GLSPS effort to acquire title to the Madeira shipwreck and obtained four Minnesota Legacy Grants to create shipwreck artifact displays at Split Rock Lighthouse (Madeira anchor), Split Rock Lighthouse State Park (Madeira bitts and hull section) and Silver Bay Marina (Hesper artifacts). Steve led the effort to acquire the main mast section of the USS Essex from the National Guard base at Port Clinton, Ohio. The restoration and conservation of the mast is an ongoing project. Steve is also an artist and an author. All proceeds from the sale of his two books, SS America, A Diver’s Vision of the Past (2000) and Shipwrecks Along Lake Superior’s North Shore (2008) continue to provide funds to the GLSPS. He has been a presenter of Great Lakes shipwreck talks to many organizations around Twin Cities, in Duluth and along the North Shore and has conducted a shipwrecks class for the University of Minnesota continuing education program. Steve promotes the GLSPS and works with local TV and Radio Stations to publicize GLSPS special events and activities. Most notably were the Jason Davis On The Road program at KSTP Channel 5 (Mayflower Project) in Minneapolis and KBJR 6 and 11 in Duluth (Thomas Wilson Zebra Mussel Project). Steve participated on a GLSPS advisory committee working with Minnesota DNR to develop better diver access to Madeira and Hesper shipwrecks. Steve’s drawing of the Madeira shipwreck is used on a DNR sign at the site in Split Rock Lighthouse State Park to orient divers on the wreck. Steve’s been a project leader and participant for many GLSPS projects during the past 19 years and has been a boat Operator for many of these projects, especially the Shipwreck Monitoring Project. On shore, he has been an active participant in the S.S. Meteor restoration project every year since the GLSPS started co-sponsoring the event. He also helped to organize the annual GLSPS dive show, which is one of the organizations main fund raising and outreach events. 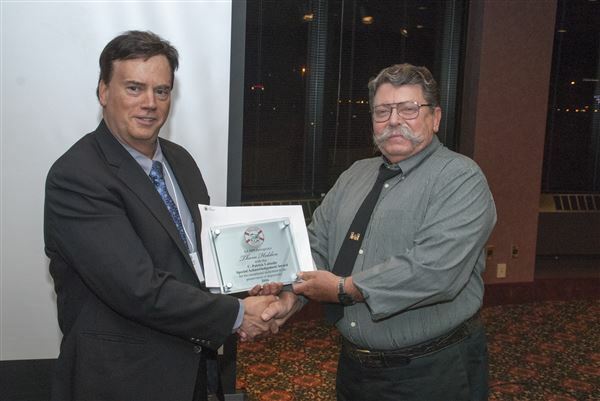 For his many contributions to the GLSPS and for always being willing to share his manifold talents and skills, the Great Lakes Shipwreck Preservation Society Board of Directors respectively thanks and honors Steve Daniel with our 2016 GLSPS Appreciation Award. Icons in our dive community open doors to new diving experiences for all of us and few have opened more doors than Elmer Engman. Aside from the three to four thousand divers Elmer has certified in his 44 years as a dive instructor, he has also opened the doors to many of Lake Superior's shipwrecks. Elmer has written three books on western Lake Superior shipwrecks including the first diver's guide to diving the North Shore and Apostle Island shipwrecks. For twenty years it was the go-to book for finding and diving western Lake Superior shipwrecks. Elmer also ran or was part of a several scuba charter operations including the Nordic Diver, the first Isle Royale Charter operation, and with his 90 ton captain's license ran charter boats Neptune then Sand Bay. In 1971 he was part of a team that explored and documented the shipwreck Thomas Wilson beyond what any divers had previously done. That project included the salvage of the McDougal anchor that is now exhibited in the yard of the Duluth Maritime Visitor Center. His exploration and documentation was part of the basis for his book In the Belly of a Whale and the start of his shipwreck newsletter Nordic Diver. Although the newsletter was only published for a short time it was the most thorough description of the North Shore shipwrecks and their history anyone had ever written. In 1972 Elmer started his diving instruction business Innerspace Scuba. In 1988 he added a storefront Innerspace Scuba Center, which he sold eight years ago when he started his new training and travel business Viking Diving. He now leads regular diving trips to distant ocean destinations. Perhaps his most well known contribution to maritime history and diving was his creation of the "Gales of November" shipwreck show. It started in 1988 as a group of divers getting together to share shipwreck photos and stories and now 28 years later after he gave it to LSMMA, it is one of the fund raising events of the Duluth Marine Museum used to promote maritime history. In his spare time he has served on countless boards and committees charged with the care of maritime treasures like the SS Meteor, the Lake Superior Marine Museum and the Great Lakes Aquarium & Freshwater Discovery Center, for which he is the Diving Safety Officer. For his many contributions Lake Superior Magazine awarded Elmer their 2002 Achievement Award. Most of us know him as a quiet man, but through his publications and actions he has spoken immeasurably in terms that will long be remembered. 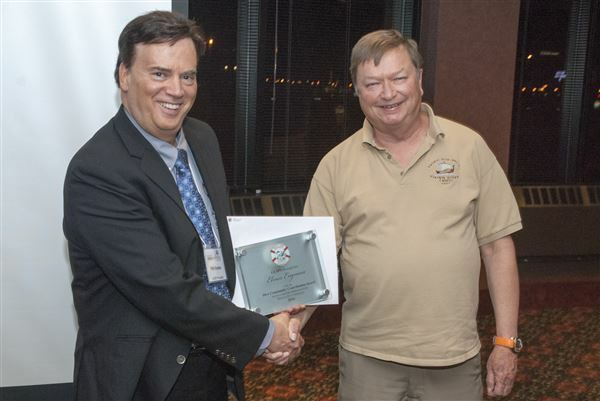 Elmer, for opening the door to exciting diving and sharing your passion for diving and maritime history with all of us, the Great Lakes Shipwreck Preservation Society respectfully honors you with our 2016 Dive Community Contribution Award. Our Great Lakes maritime history community has been blessed with dedicated professionals who are eager to work with shipwreck divers in a mutual quest to solve maritime mysteries. Thom – a magnificently mustachioed Wisconsinite is certainly one of those professionals. Although recently retired, he first took a job as a caretaker naturalist in Greenwich, Connecticut, after graduating with a bachelor’s degree in mechanical engineering and a master’s in journalism and recreation resources management from the University of Wisconsin-Madison. Thom has always had a special interest in Isle Royale and was somewhat of an expert on Isle Royale shipwrecks. His 1985 book Above and Below was the accurate source of shipwreck and lighthouse history that most Isle Royale divers of the era referenced. He spent many hours researching the mystery surrounding the Kamloops sinking and shared his research with the wreck finders and explorers. He is a prolific writer and has written for the LSMMA newsletter The Nor’Easter, contributed articles to Lake Superior Magazine starting with an article in 1979 for the premiere issue of Lake Superior Port Cities (the original name). Naturally, he wrote about an Isle Royale shipwreck, the steamer America. Thom also helped the late Dr. Julius F. Wolff, Jr. revise his book Lake Superior Shipwrecks, the bible of Lake Superior shipwreck hunters and local maritime history enthusiasts. He has built exhibits and has given countless talks on Lake Superior maritime history. Although he is often called on to speak, Thom is also content to be in the back of the room shooting video while others present and that is where you often saw him at Gales of November. His friendly attitude and enjoyment of sharing his passion for the shipwrecks has endeared him to all of us who share that passion. For sharing Lake Superior Maritime History with thousands of visitors to the Duluth Marine Museum and thousands of divers in shipwreck shows and friendly conversations, the GLSPS proudly presents Thom Holden with the 2016 C. Patrick Labadie Special Acknowledgement Award. Excerpts from Lake Superior Magazine January 2013 edition.